I thought it was important to post the following advance of writing a comprehensive trip report. On arriving in the search area last week, I found fresh scaling on a downed, recently dead sweet gum. The tree was relatively small, with a DBH of under two feet, and was alongside one of the roads that pass through our search area. There was fresh work on it on subsequent days. I staked it out on Thursday and saw nothing. We placed one of our game cams on it on Friday and retrieved it late Saturday. The trail cam photos showed a squirrel removing the bark fairly extensively. These images are currently in the game cam’s proprietary format, and we’ll post them in the near future. As is the case with many of these blowdowns, there was also work in the tops that looked very consistent with Tanner’s descriptions of ivorybill scaling, although only on the upper sides of the limbs and branches. 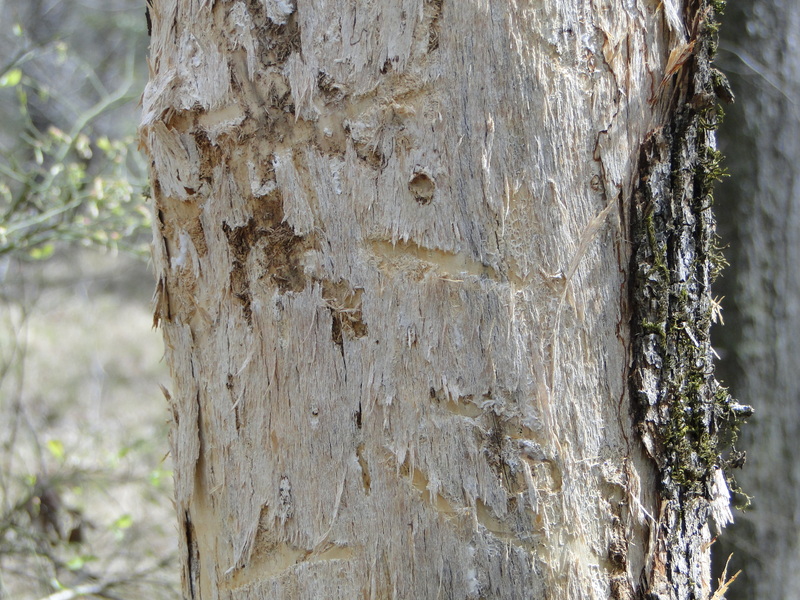 What this tells us is that we have to think squirrels are likely responsible for scaling on downed sweet gums and that all possible sign on downed wood should be looked at with a jaundiced eye. It also means that my previous foraging preference analysis has to be revised; we’ve taken that page private at least for the time being. Scaled area on bole of downed sweet gum. A squirrel expanded this considerably, working from left to right, toward the base. and thus are all considerably longer than they are wide, stripped with the grain rather than scaled. The edges that go across the grain have a ragged appearance, and since the tree was not mature, the bark is thin and brittle compared to the bark of the mature downed top discussed below. It’s odd that we only started finding this type of work in abundance in the past year; it doesn’t exactly match the diagnostic criteria I’d articulated earlier, but it comes close in some respects. It has been an unfortunate distraction, since the work on downed trees is much easier to find and photograph than work on the boles or upper branches of standing ones. 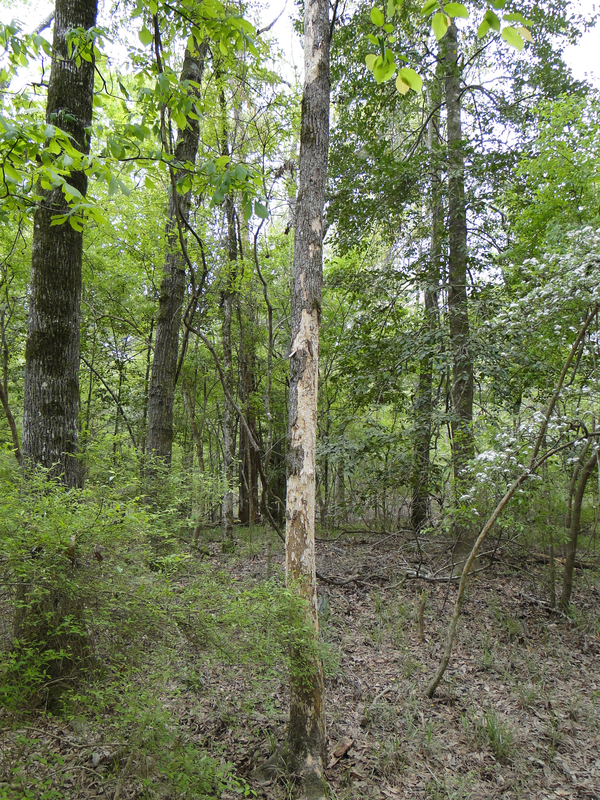 There was a little bit of fresh work on the downed sweet gum top found in April, but it was not extensive enough even to show up in the game cam images. There were a few chips on the ground, more like strips than chips, actually, 6′ to 8′ inches long and no more than an inch across at the largest. We’ve had numerous images of squirrels on that top but none showing them scaling bark for a period of more than two months. We got numerous images of squirrels again this time, and also a pair of Pileateds, with a Downy or Hairy (we didn’t examine the frames very closely) literally trailing the PIWOs up the trunk. In any event, there was no way to tell what did the little bit of scaling, or what did the scaling on the upper part of the downed top or the left fork, which had been almost entirely stripped before we got the camera on it. I lean toward this little bit of new work was done by the Pileateds, but either way the chips don’t have the characteristics I associate with suspected ivorybill chips. I had been planning to do a post refining and being more explicit about the different types of work I’d been ascribing to ivorybills. I still plan to go ahead with this project but will have to do so informed by this new information. I expect to write something later this month, after I’ve posted the trip report. While squirrels cannot be ruled out for some of the work we’re finding, it seems unlikely that squirrels are doing all of it, especially on the boles of dense-barked, mature trees (like the hickory on the homepage and most of the others shown here) that have numerous cerambycid exit tunnels and on those that are not quite so freshly dead (and therefore don’t offer as much nutritional value). We monitored the tree on the homepage for several months and had no evidence of squirrels removing bark. The chips shown in the bark chip gallery are mostly as large as or larger than an adult man’s hands. Chip size, shape, and density are probably factors that need to be looked at very closely, and perhaps the contrast between a very ragged, gnawed appearance and a cleaner one with apparent bill strikes is another key aspect. This little, dead gum (not oak, I think), because there are apparent bill strikes in the cambium and other obvious signs of lateral blows. When it comes to high branch scaling, squirrels can do extensive damage, as in this example on a sugar maple. At the same time, some of the high branch work we’re finding shows clear signs of insect infestation and woodpecker involvement, as in this downed sweet gum limb I found on Saturday. The scaling took place before it fell. In next example, although the scaling has a little bit of the layered appearance we’ve suggested is more characteristic of Pileateds, it’s clear that woodpeckers are involved, since there are a few places where what we presume to be insect tunnels have been expanded. There’s also this one, which I initially thought could be due to natural sloughing, but how would sloughed bark fall at an upwards angle? While I was initially disappointed by this new data point, not only because it compels me not only to reexamine certain aspects of my hypothesis but also because it eliminates the types of targets we’ve thought most promising in terms of obtaining clear trail cam photos, I recognize that this is part of the process. It’s an opportunity to refine the hypothesis and a reminder to observe carefully. Ultimately, I think there’s more room for confusion between squirrel work and what I take to be IBWO work. We can’t help but wonder whether Tanner himself might have been fooled in some instances. Lots to think of here. Could it be that squirrels are using bark and cambium for nesting material? If so, then timing of the work could help determine what did it. We’ve found work that is likely done by squirrels in spring, fall, and winter. Why they’re doing it is a bit of a mystery. With cypress bark, it’s almost certainly for nesting material. With sweet gums, it’s likely something else. Most of the references I’ve found suggest that it’s for food, from sap and cambium, especially when mast is scarce. It seems to be a more common behavior in the British Isles, where squirrels are introduced and there’s less forest. Mast is abundant in our search area in fall and still is even into winter. Also, this work is on dead trees, so the nutritional value would be substantially lower. At the same time, it has all been on sweet gums, so perhaps taste is a factor. Another possibility is that they’re going after insects that live between the bark and the sapwood, as woodpeckers do, though I haven’t seen this suggested anywhere. Then again, perhaps they’re just gnawing as rodents do. It’s very puzzling that there’s so much of this work in our mature bottomland forest search area and not elsewhere. All of that said, there are ways to distinguish. I’m quite sure about some of them; others are a little more speculative. I’m gathering materials and will have a post about it in a week or so, after the trip report goes live.